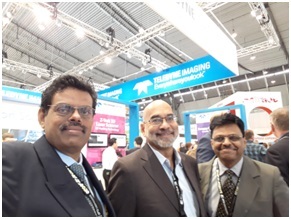 VISION Show —held every other year in Stuttgart, Germany— is the world’s largest trade fair for machine vision and imaging. From November 6-8, 2018 component developers, system providers, and integrators from across the world gathered at VISION Show to discuss the latest and greatest machine vision technology. Attendees had the chance to meet with suppliers from all over to learn about the latest ways to solve their machine vision and imaging needs. VISION Show has always reflected the industry sentiment and displayed current machine vision trends. This Year’s Vision Show had indicated that the machine vision industry has been in very good condition throughout the entire year and prospects for some excellent business development. We Online Solutions (Imaging) Pvt. 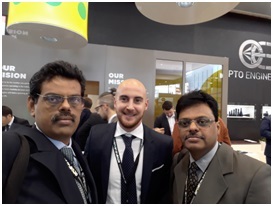 Ltd., as Vision supplier and solution provider in India for more than 2 decades had visited the show as a visitor on all the three days. This year’s vision show had more stalls inside and even outside the main hall. 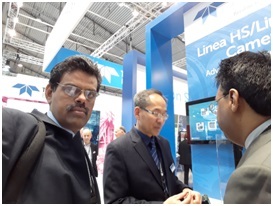 Exhibitors from all across Europe, USA, Canada, China, Taiwan, Japan, Korea, India had their booths and displayed their products and solutions starting from accessories to more complex embedded and Deep learning systems. 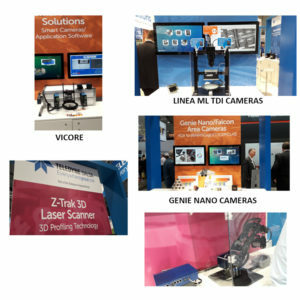 Exhibitors showcased the latest application-specific machine vision systems, lighting and illumination, optics and lenses, sensors, software, cables and connectors, frame grabbers, and cameras, including area scan, line scan, high-speed, infrared, hyperspectral, multispectral, X-Ray, and smart cameras. We – Sukumar and Senthil Kumar – Directors of Online Solutions (Imaging) Pvt. 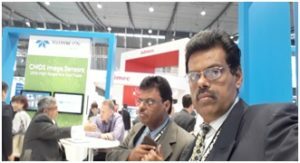 Ltd., Chennai India visited the Vision Show and concentrated on few manufacturers in particular. Teledyne DALSA now named as Teledyne Imaging had a huge stall displaying their Genie Nano Variants, New Linea ML range of Line Scan and TDI Cameras, New products from IPD like VICORE, 3D Profiling systems with camera, Laser and software integrated for depth measurements, Sherlock software with Deep Learning tool, Low cost and high end sensors from e2v (acquired by Teledyne) recently and Calibir range of Infra-red Cameras. 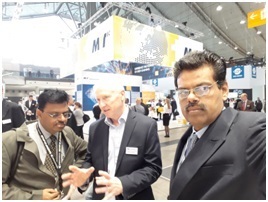 Mr. Keith Reuben President, Executive Vice President – Digital Imaging discussed about India’s growth in terms of Machine Vision and Industrial automation. Mr. Manny Romero Product Manager Genie products explained latest 5 GigE products in the show. Mr. Xing Fie from Line Sensors explained about new sensors for different applications. Mr. J P Luevano explained about current and Future product line in Calibir the infra- red cameras. Mr. Inder Kohli explained about the new 3D Cameras – Laser based profile measurement systems and demonstrated the same. 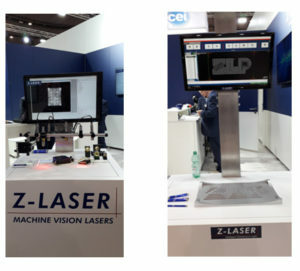 Z LASER – a pioneer in LASER Lights displayed their latest products including one for tracking RAILs of railway. Mr. Tobias Burkele of Z LASER explained about their whole product range. IO INDUSTRIES from Canada displayed their unbeatable Digital Video Recorders and also their new cameras in CXP. Mr. Andrew Searle of IOI explained about the new cameras and recorders. 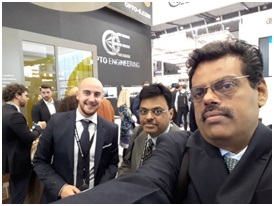 OPTO ENGINEERING showcased all their Telecentric solutions in terms of Lenses, Lighting and also their own systems that include complete machine vision solutions including cameras, deep learning etc. Mr. Riccardo Consolini of Opto Engineering discussed about their product line. OPTO ENGINEERING has agreed to have ONLINE SOLUTIONS (IMAGING) PVT. LTD., INDIA as their re-sellers in India for their range of products. 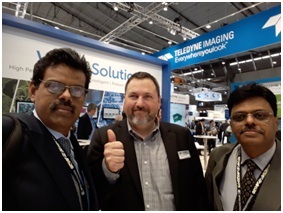 BASLER – Germany displayed their successful ACE range of products in Area Scan, Runner Line Scan series, Embedded Systems, Frame grabbers of Silicon Software, Lighting controller with Pylon software, ToF cameras and newly designed MED ACE Cameras with specific certification. 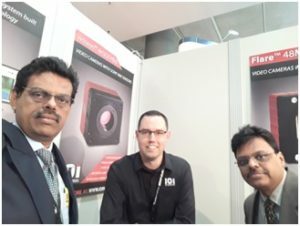 ACTIVE SILICON – a company involved in manufacturing Frame grabbers, Embedded Systems, GPU based systems, Camera based embedded systems displayed their wide range of products. Mr. Frans Vermeulen xplained heir product line and also showed his willingness to work with Online Solutions India for India market on project basis. XiMEA– a company involved in High Speed Cameras (direct PCI Xpress output), XRAY Cameras, Hyper Spectral Cameras, Machine Vison Cameras, Scientific Grade Cameras displayed all their product line. They had an attractive booth with Black Orange combination. Mr. Ivan Klimkovic explained their product line. Online Solutions would also represent them as their resellers in India. SUALAB Korea – a growing company in the field of DEEP LEARNING in Machine Vision demonstrated the capabilities of their software products. SUALAB had signed a distribution agreement with Online Solutions India to represent them and sell their SuaKIT products in India. MORITEX – a leading LENS and Lighting company from Japan showed their latest telecentric lenses, Line Scan Lenses and also their new CCTV lenses portfolio. Vision Show 2018 was a successful show for all the participants and also to Online Solutions India. Looking forward to next show in 2020…..